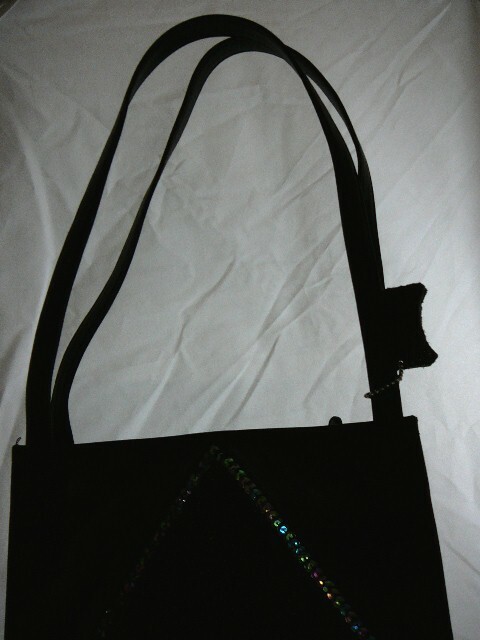 #EL-1-1 Stunning stingray leather and black (cow) leather purse; with a large diamond shaped piece of stingray leather center with iridescent sequin trimmed edge. 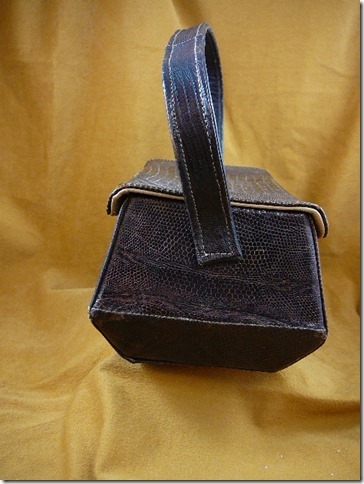 Purse is 11-1/2" long x 8-3/8" wide x 3-1/2" deep, with straps 22-3/4" long, straps alone are 10" long x 5/8" wide. Open top with attached center floating zipper compartment and side zipper pocket. Flat bottom, may not stand on its own. 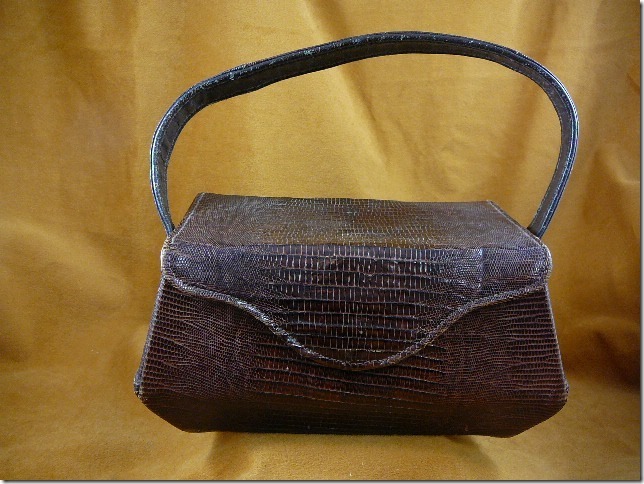 This is an exquisite and exotic accessory anyone would like to have in their collection! Stingray is tanned, dyed black, the center left natural. The shiny, durable pebbly textured surface is such a high quality! STINGRAY WON'T BURN, BREAK OR FRAY AND IS WATER-RESISTANT. Red vintage eel skin clutch purse, measures 10” long x 6” tall x 1-1/2” thick, expands to 2”; Lined with matching red pigskin suede; 46” shoulder strap; main pocket plus 2 zippered pockets and 2 other pockets; snap closure. No evident wear or damage. Tag: Genuine Eel skin, made in Korea. (Rare) Tiny to small in size, vintage (circa 1950's), they used to be very popular as a collector item (stuffed, or as purses), now they are protected. "Caiman" is a Spanish term meaning "crocodile" or any Crocodilian. Despite pressure from hunting and also collection for the pet trade, however, existing surveys suggest that populations are in relatively good condition in most areas (e.g Venezuela). This seems to reflect the adaptability of the species, its reproductive potential, and the increase in available habitat through the removal of competing species and an increase in man-made water bodies (e.g Brazilian Panatal, Colombia, Venezuela). Today, only the Spectacled Caiman is hunted in large numbers in the Panatal area of Brazil, the others remain protected. 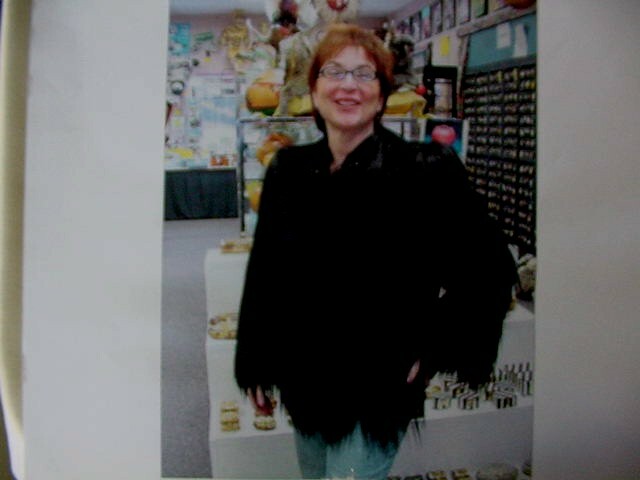 The pelt can be removed from the purse for other uses. 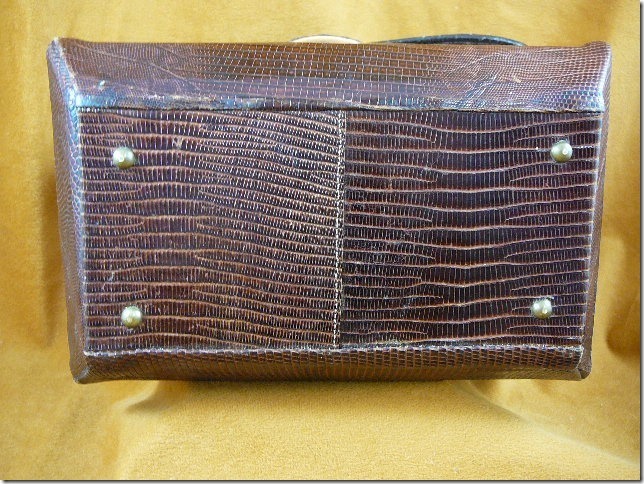 17" long x 11" wide x 3-1/2" deep; strip of hide missing on side of purse flap & lifted square on inside front right. RARE, made in Cuba. 8" long x 5" tall x 4-3/8" deep, this PIRATE CHEST wooden box with rounded lid, C hook clasp, riveted, inlaid with brown/tan GATOR HIDE, felt flocked lined, GATOR HIDE handle is riveted to box. 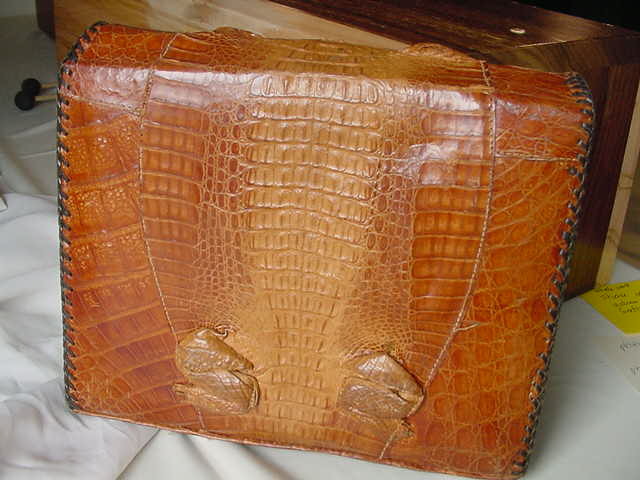 This is a one of a kind gator scute and vintage button purse. Purse is made of woven hemp and has two gator scutes and vinatge and paua or abalone shell accents. Zipper closure with silk lining on the inside with zipper pocket on the side, 11-1/2" wide x 7-1/4" tall (center measurement) x 3-5/8" thick (bottom), measurement from the top of the strap to bottom of the purse is 24" long. Wildebeest, ostrich, water buffalo, crocodile, impala, warthog as shown. All the skins come from wildlife farms or registered hunts. Shoulder purse. Patchwork leather of Wildebeest, ostrich, water buffalo, crocodile, impala and warthog. Lined. With info ID tag attached. 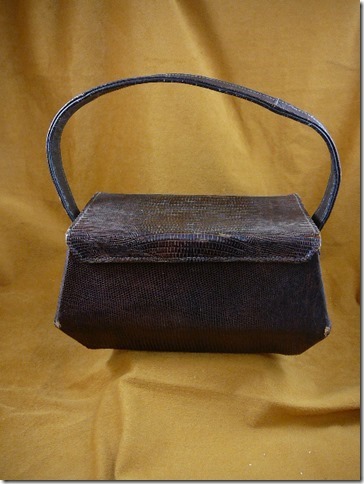 Measures 10" long x purse itself 13", 17" height incl. shoulder strap; strap is 7/8" wide. 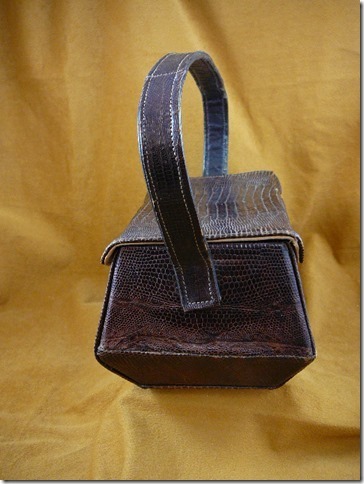 All genuine warthog leather, ID tag attached; measures 13" wide x purse itself 7-1/2" tall, 24" height incl. shoulder strap; strap is 1", movable reinforced shoulder piece. Inside zip pocket, outside zip pocket & snap pocket. Lined. Cinch Purse with brass round rings, brass Patchwork leather of Wildebeest, ostrich, water buffalo, crocodile, impala and warthog. Lined. With info ID tag attached. 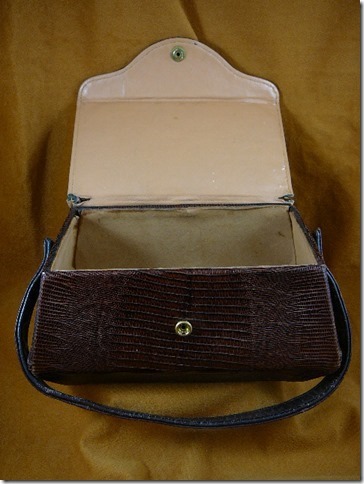 Measures 11-1/2" wide x 11-1/2" tall, purse itself; shoulder strap extends 14" above opening of purse; base is 5" deep; outside vertical zip pocket (for gun stash) & inside zip pocket; lined; brass ring on bottom connects to clip on strap for side carry. This is an invasive species in Florida, they are caught by nuisance hunters. This is a way to process some of the iguana to useful purposes. Species: Iguana iguana. NOT a protected species. 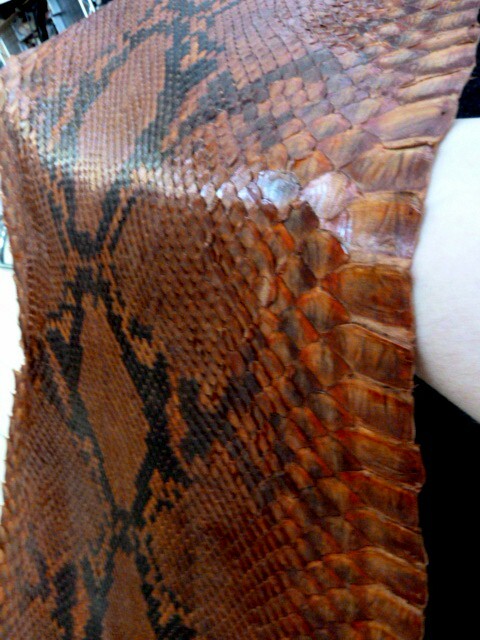 #EL-200-1 Genuine iguana skin/leather/hide, beautiful texture; tan/black color with an unusual IRIDESCENT GREEN SHIMMER (difficult to capture with camera)! Wow! 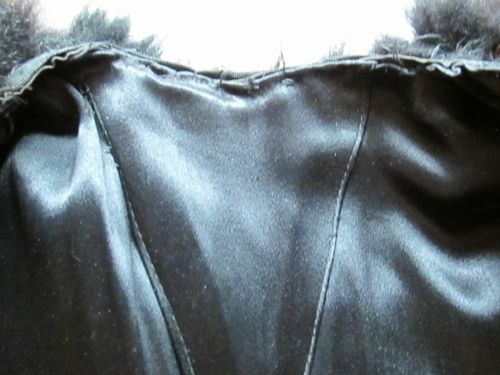 Black rawhide hand stitched edging. 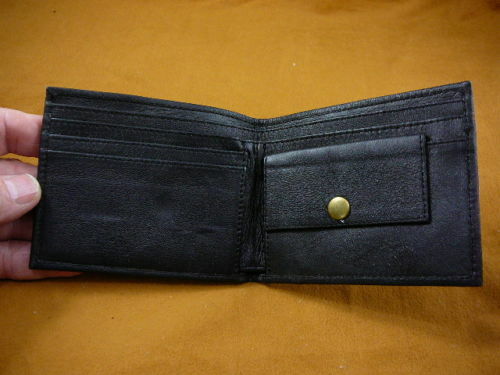 Measures a folded 4-3/4" long x 3-3/4" wide, bi-fold wallet with dark brown synthetic lining, double sided with credit card slots, and divider for bills. Measures 5'6" long, full skin taxidermied with head & feet, mounted on a board covered with green felt. Back wall hanger. 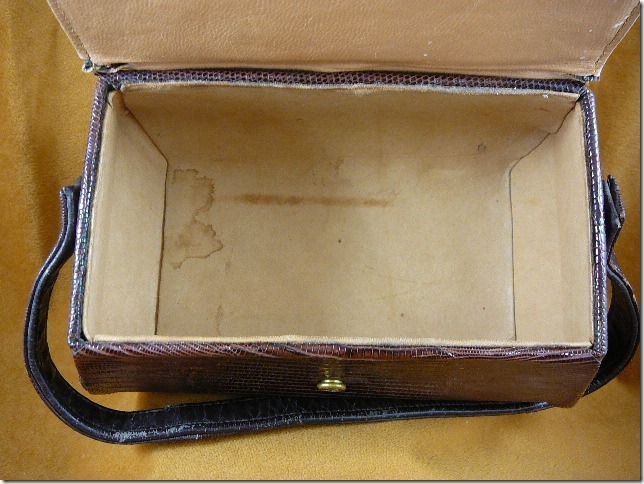 Interior is a soft tan smooth leather on inside lid, suede feel of leather on interior of box. Minor water stain on bottom inside. ..for the person that thinks they have everything! 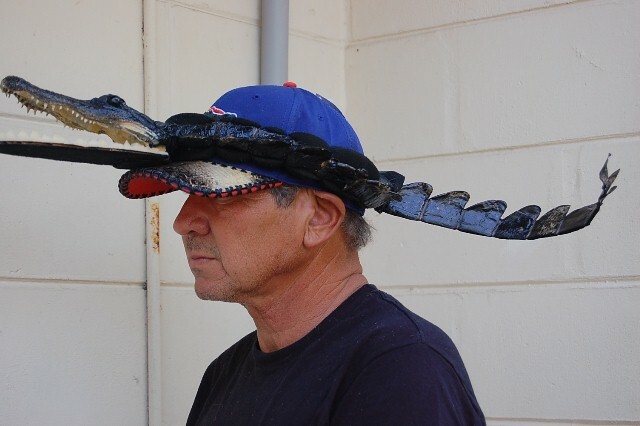 Our friend Dale has made a new weird gator hat band using a gator head and tail portion. DISPLAY ONLY. NOTE: The kangaroo is subject to Australian Government protection, but needs to be constantly culled owing to its prolific breeding habits, so they don't starve to death from overpopulation. The hides are tanned and sold, the meat is eaten, and every possible part of the roo is made into something to be sold in a secondary market such as this. Kangaroos are NOT caught for these pouches! This is a byproduct made into something useful, just as byproducts of pig, cow and sheep farms. with drawstring. Comes with info card. The real thing, folks! #EL-900-1 REGULAR size averages 4 to 4-1/2" long. Stock photo. Averages 2" wide x 5" long including keychain. Once upon a time there lived in the center of Australia an aboriginal boy. One day he came upon a small kangaroo in the bush, caught it by the tail, and made a purse out of its dear little symbol of masculinity. He gave it to his girl, and she kept seeds and berries in it. Next he saw a large kangaroo. He caught it with a spear and made another purse from its thick symbol of masculinity. He gave it to his father who kept stones and things of value in it. Ever since then, male kangaroo scrotum purses have been popular amongst the aborigines. For women, the soft pliable one; for men, the strong, wrinkled one. They became as important as one's own symbol of masculinity and were recognized as bringing luck. That's why kangaroo scrotum purses are called "Lucky Bags" or "Lucky Pouches". A great Aussie story for you - when the Europeans got to Australia, they saw a big jumping animal. Amazed at what they had seen, they asked the Aborigines what they called the creatures. One Aborigine man replied "kangaroo", which means when translated "I don't understand your question". Okay, you can smile now, but next time you don't understand someone, you can say "kangaroo" too and share the fun. The Aborigines in Australia use the kangaroo as a lesson in life - it cannot physically move backwards. 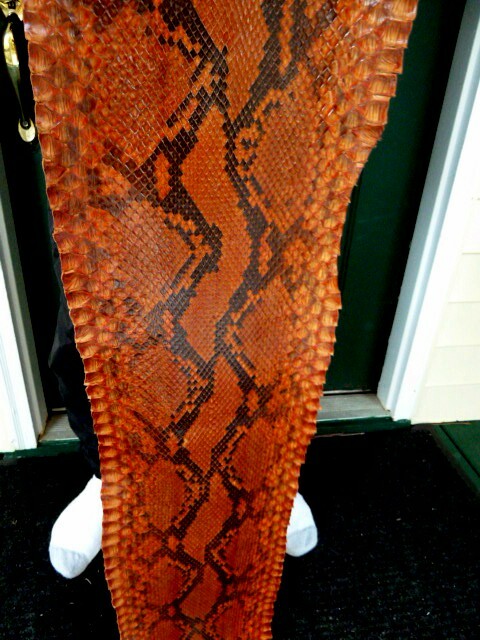 Enjoy this kangaroo skin as your own lesson in life to always look forward to the future, not backwards at what cannot be undone. #EL-900-100 Genuine kangaroo paw back scratcher! 13" long, partially wrapped and sewn roo hide from paw down the bamboo stick about 6". Keep in mind the kangaroos are hunted by government permit only, if they did not keep the numbers down they would starve in the winter, which is worse. Then 100% of the roo is recycled (the meat is eaten, the hide is used, even the feet as you see here, much as deer here in the U.S.) Information card comes with it. The Javan spitting cobra (Naja Sputatrix) also called the Indonesian cobra, is a stocky and highly venomons species of spitting cobra native to Indonesia. MEASURES 45-1/2" long x 4-1/4" widest, beautifully tanned. 7' 8" long x 13-1/2" widest (7-1/4" narrowest). The closest specific genus we can find to match this pattern is called a "garden boa" with a drawing of this wide sideways diamond pattern on the internet. 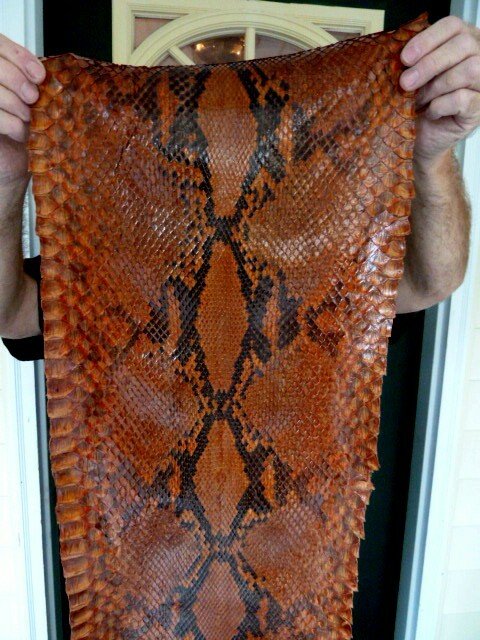 This is NOT a shed skin, it is a fully skinned boa constrictor leather tanned hide. Beautifully tanned, it is thick, sturdy, supple, chestnut coloring, with a black side-to-side diamond pattern. Extremely impressive to hang on a wall. 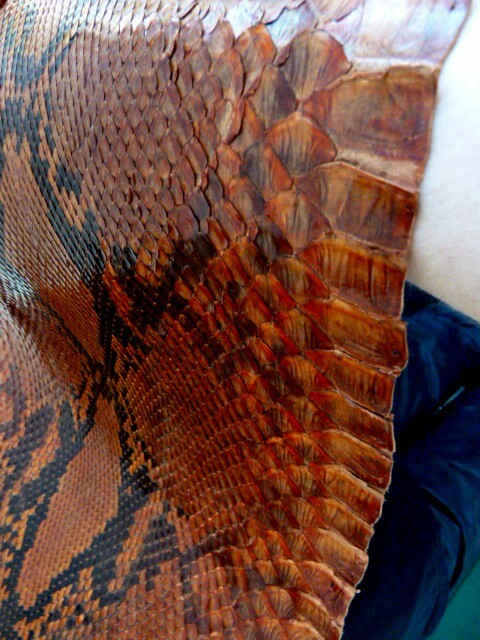 Close up of the hide showing the glossiness of it, and the edging scales. Imported from Hawaii to eat a cane beetle, Aussie's found out it doesn't eat the beetle! Gators eat them and die - pet dogs eat them and die - they're toxic toads! 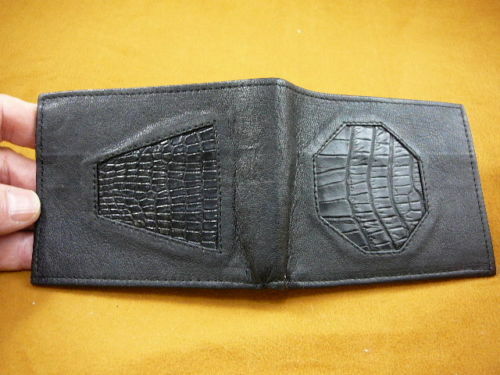 So they're caught and processed into coin purses such as this. The toxin is being studied for cardiovascular and cancer research, which the Chinese have been using for centuries. Some have even smoked the skin as a hallucinogenic! 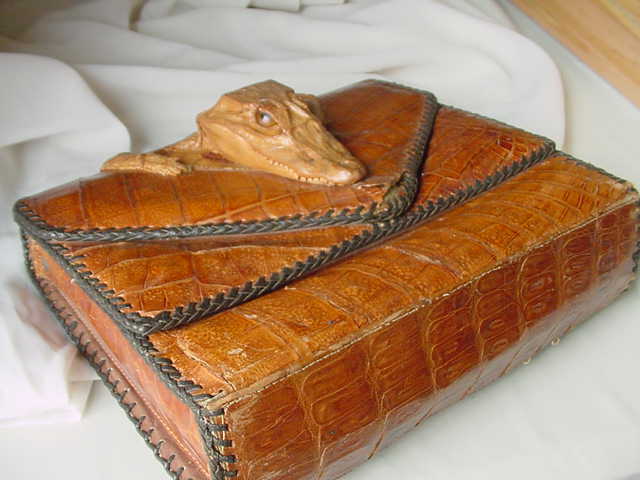 Of course, the tanning process eliminates any poison - and the tanned leather is surprisingly thick and durable! For the person who has everything, bet he doesn't have this! 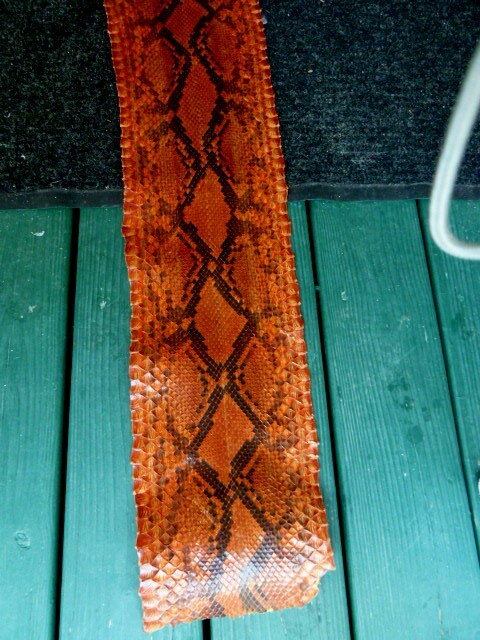 Great as a gift or for use in your own craft projects using an exotic & affordable leather. 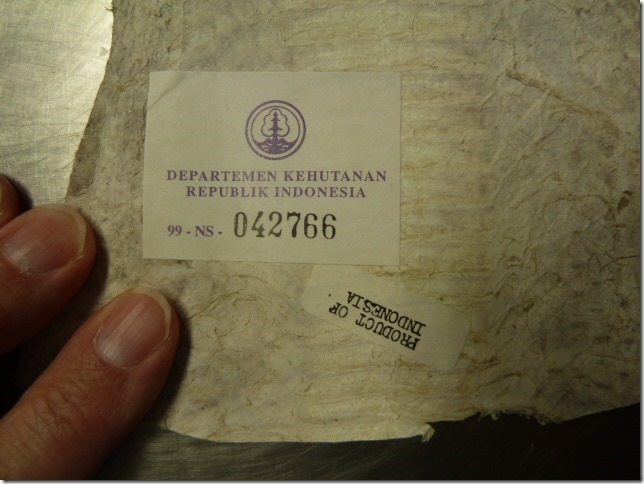 This product does not require a CITES certificate. Photos below are STOCK PHOTOS, QUANTITIES AVAILABLE, unless stated otherwise. "Lucky Toad" Entire TOAD is tanned, PAINTED GOLD, cotton stuffed and carries a lucky coin in his mouth. Yes, he has front legs AND back legs. A great lucky charm! #EL-1000-31 EXTRA LARGE, Avg. 9" long, cord is adjustable to 21" long. 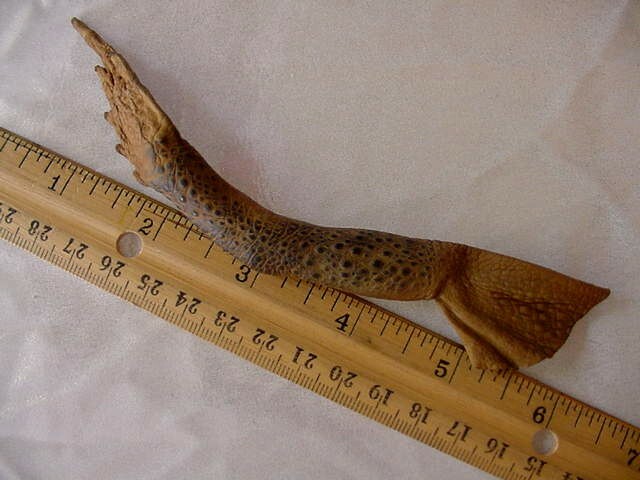 #EL-1000-40 "LUCKY TOAD SKIN." TOAD skin is a tanned piece of hide. Averages 6-1/2" wide x 3-1/2" long. Great for all of those trophy hunters! Zebra skin. A gentleman who owned a zoo in North Carolina had two zebras, this one, named Stripes, got his leg caught in the fence and died of shock overnight before he was found. They salvaged the skin, he knew it would have a good home with us! The full tail is there (picture #4), everything on the head right down to the eyelashes (picture #3). Picture #2 is a close up of the head itself. We will be mounting it on plywood soon to hang on the wall. Rare to find this complete of a zebra skin. Acquired in the New Mexico desert, near Alamagordo NM, believe it or not. 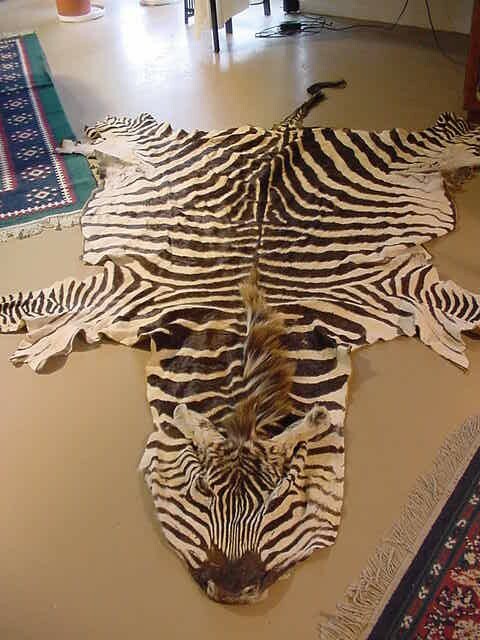 One of the largest zebra skins, in excellent condition. Includes legs, tail, mane, and head leather. Tip of nose to base of tail is 9 feet long; width across front legs is 79"; width across rear legs is 78"; tail measures 32"; widest part of head between ears is 17"; width across the nose is 14"
This is our good friend-Rona-from-New-Jersey-who-started-out-as -a-customer, modeling my vintage 1920's "Gold Coast Monkey" coat. YES, it's genuine monkey ! I bought it in California (I'm NOT a fur person, but this was too intriguing to pass up) and since it's vintage and now endangered, it's a pretty special piece. Thank goodness it's not being made anymore. The hair is like real human hair - it's really spooky. 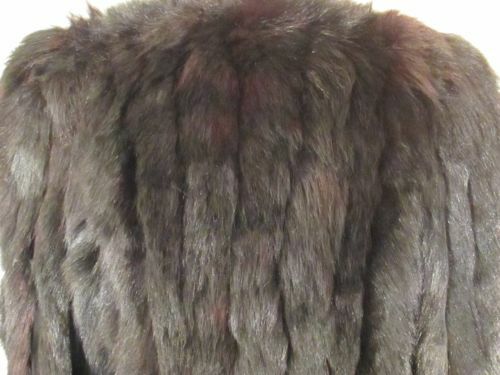 It was assessed at $20,000 by a Consignment fur store in Beverly Hills, CA. And though that is the ideal venue to sell the coat at the highest possible price, they do not handle endangered species. This species of monkey has silky human-like hair that grows to 5" long or more. 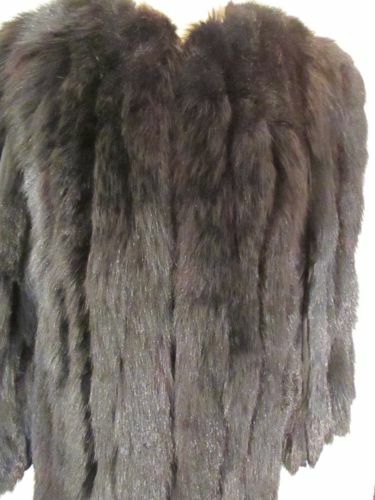 Monkey fur was very popular from the mid-19th century through the 1940's, when this coat was created. We are not in the market to buy another. 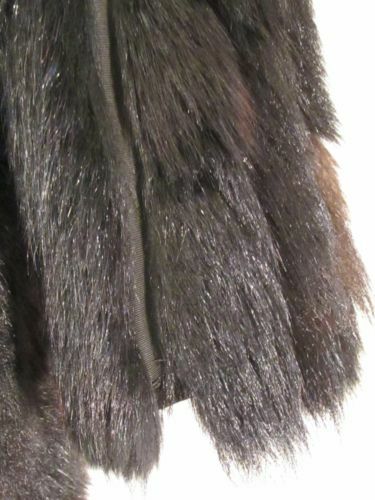 So if you have a similar coat or stole that has been passed down to you, you may evaluate its worth by checking on Ebay where we have found monkey fur coats sold on a regular basis, though generally not this quality and hence, not at this price. Update, friend Linda tries the coat on for fun. What a find in a Virginia antique store! 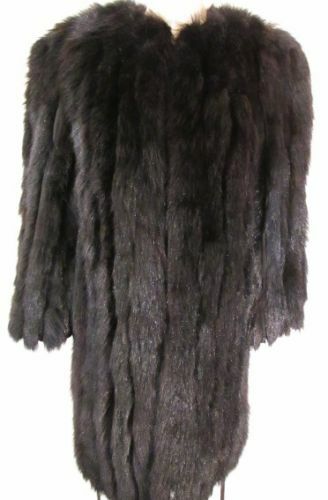 Vintage (circa 1920's) genuine black bear fur, made into a size 8-10 women's coat. Measures 25" long; 19" between shoulders; 14" from underarm to end of sleeve. Fur and Lining are in perfect condition. "GSD" hand stitched inside one lapel. Label "Levy's Ladies Toggery Inc., Main at Union, Memphis Tenn".